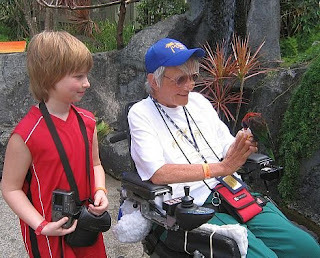 Cruises for Wheelchair Users & Slow Walkers: Plan and Just Do It! Plan and Just Do It! I remember my first "almost cruise" oh so well. It was spring in Maine, 2003 when I was notified that my college was sponsoring a cruise to Norway. I was delighted until I discovered it was not wheelchair accessible. Not to be discouraged, I caught the travel bug anyway and was convinced there must be a way to travel again. After all, for the past 20 years as a quadriplegic I had been helping my three sons finish high school, graduate from top-rated colleges, marry and reward me with five grandchildren. Wasn’t it time for me to do something for myself? I searched for wheelchair travel and after some planning I was off on a cross-country flight to Vancouver for a 7-day Alaskan cruise with a caregiver. The cruise was fantastic with beautiful glaciers, a train ride to Whitehorse, and a catamaran ride to see humpbacks! I did, however, learn to check the airline cargo area ahead of time and to arrive at the departure city a day in advance. I was "hooked" and six months later in 2004 I was again headed cross-country to San Diego for a 15-day cruise through the Panama Canal to Miami with stops along the way. While planning ahead of time, which is so important, I found there was an accessible van in Costa Rica that provided options on what highlights to see. Hawaii was the destination for 2005 with a 15-day cruise from Los Angeles. On this cruise I learned to reconfirm one’s excursion reservations. The first port had coaches but the cruise line overlooked the fact that I needed one with a lift. It only happened once on that cruise as the cruise line had learned a lesson, too. Winter in Maine may be beautiful, but a Caribbean break is certainly nice. In 2006 I took two cruises with my family to the western Caribbean. I had a hard time finding wheelchair accessible tours on the internet but I did find something even better – Vicki at Connie George Travel. I could hardly believe I had found such a goldmine of experience! I make a suggestion of a place to go and ended up with a number of options from which to choose. Planning a cruise had never been so easy and so much fun! In 2007 I cruised from San Juan to Manaus, Brazil and back in 24 days, stopping at 10 ports. This was a back-to-back cruise (booking two cruises to make for one longer vacation) resulting in eight of the ports being visited twice. There was so much to do that repeat ports were no problem! In 2008 I was another decade older and passed the 26 year mark of wheeling. Four cruises with family included the Caribbean and a cruisetour of Alaska. We also fit in a ten day trip to Disney World which made one of my sons and granddaughters very happy! Advanced booking, I discovered, has added benefits as I plan for 2009 and 2010. I have learned over the years that keeping up-to-date packing lists are valuable, but the most valuable asset is an excellent travel agent - Vicki! Eunice Spooner caught the “travel bug” as a student of Colby College and became a world traveler. Despite a life-changing auto accident at the age of 44, Eunice finished earning two Master’s Degrees, raised her sons and was busy as a teacher. Retired and with less responsibilities now, she keeps busy with again exploring the world.